“Domaines” could have been titled “Dialogues”, or “Echanges”. 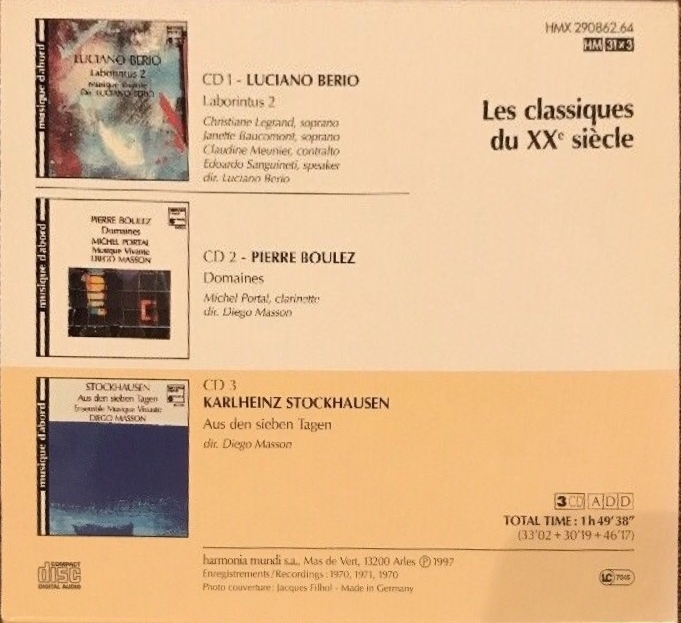 The piece first originated as one for solo clarinet, slowly written between 1961 and 1968, probably under the influence of Berg’s Four Pieces for Clarinet and Piano and Stravinsky’s Three pieces for clarinet, which the composer had programmed many times with his Domaine Musical. 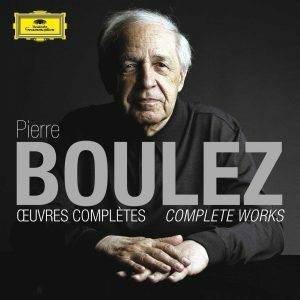 In it, Boulez continued his exploration of the composition for solo instrument, begun with the piano in the three Sonatas and Structures for two pianos (Boulez of course was himself an accomplished pianist). That version was premiered by German clarinetist Hans Deinzer on September 20, 1968. 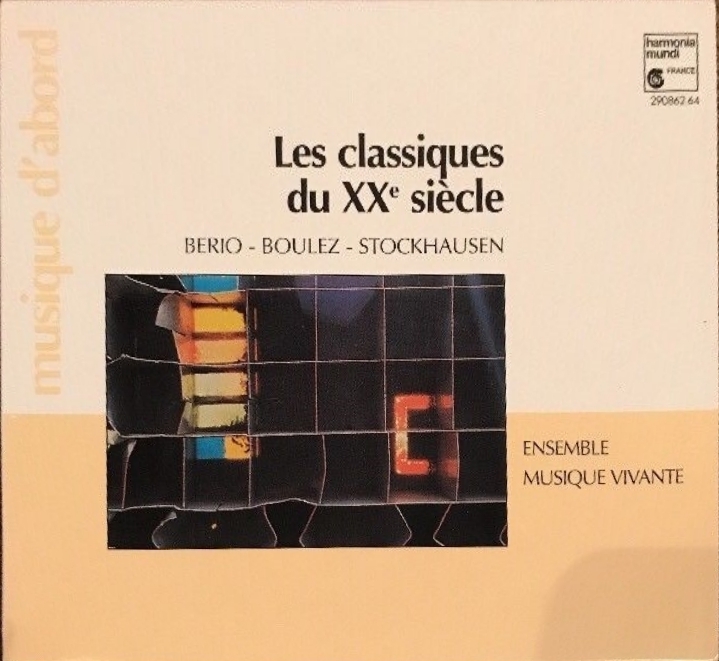 But in 1968 Boulez expanded the piece and turned it into a kind of music theatre (a genre very much in vogue at the time), in which the clarinet player walks successively to each of six different instrumental groups placed in a circle around him, and engages in dialogues with them, or rather something like calls and responses (playing by ear there is no mingling). The groups are as different as a string sextet, a quintet with flute-trumpet-saxophone-bassoon and harp, a trombone quartet, a trio with oboe, french horn and electric guitar, a duet marimba-double bass and a solo bass clarinet. Each group is written in a distinct expressive style, the trombones for instance in stark blocks of sounds, or the quintet voluble and excited. The clarinetist’s choice of the order in which he will walk to this or that group is his, so, in that sense, the work is open and no performance is exactly like another one. There’s also a measure of choice in the way the soloist and instrumental groups execute their parts. In the composition’s second part, called “mirror” (in opposition to the first part, “original”), it’s the other way around, each instrumental group calls and the solo clarinetist responds, both in retrograde melodic form. Again the succession is left to the performer’s choice – here, the conductor. 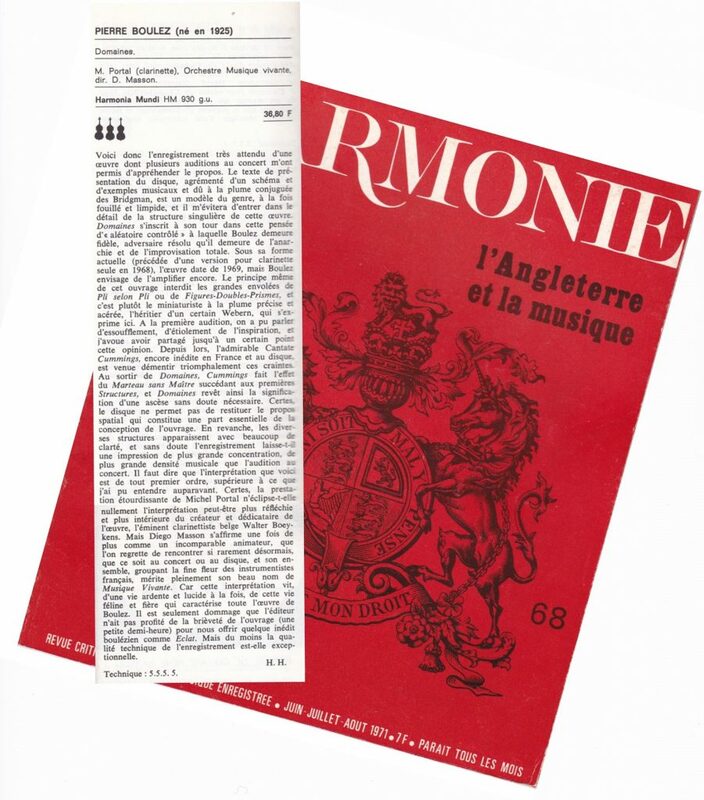 This expanded Domaines (also known as “Domaines II”, while the original piece for solo clarinet became “Domaines I”) was premiered shortly after the solo version, on December 20, 1968, by Walter Boeykens and the Brussels Radio Symphony Orchestra under the conductor. 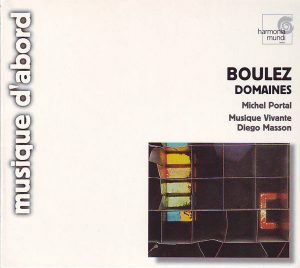 Boulez thereafter slightly revised the score and the new and definitive version was outed on November 10, 1970, by the same forces who recorded it shortly after for Harmonia Mundi. 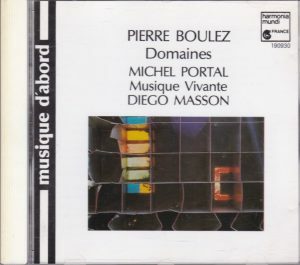 I find Domaines II to be one of Boulez’ most accessible pieces – if you are well attuned to “contemporary music”, that is. Don’t expect Broadway, but there is a playfulness in the exchanges and the tossing back and forth between soloist and instrument groups, as well as in the unexpected instrumental combinations of the six groups – meaning, a Boulez kind of playfulness, quite stern, but nonetheless. 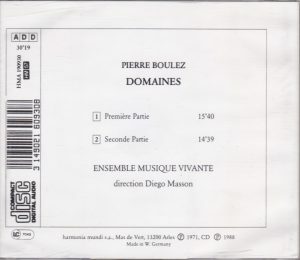 I’m surprised that it’s not been recorded more – in fact, while there are a number of recordings of the solo version, this appears to be the only one of Domaines II – so much so that DG licensed it from Harmonia Mundi when they issued their big set of Boulez’ complete works in 2013. 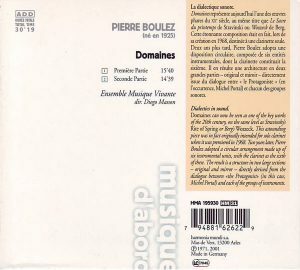 I don’t know that Boulez disowned the piece and retracted it from his catalog, as he did with some other of his compositions, although he did express, apparently, some dissatisfaction with it and its predictability, later regretting that the other instrumental ensembles were left in the lurch while the soloist was exchanging with one of them. That said, the very nature of the piece, as much a spatial experience as it is a sonic one, makes it difficult to record satisfactorily – unless you can do it in surround sound. 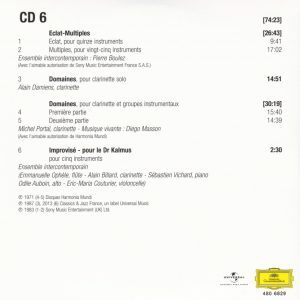 Harmonia Mundi’s recording has some awkward sonic perspectives, with the clarinet assigned to one channel, some jarring jumps from one channel to the other to “mimic” the movement, and at times a very artificial positioning of the instrumental groups along the stereo spectrum. It might not be bothersome if you are listening on loudspeakers, but it is sometimes awkward heard on headphones. DG’s reissue hasn’t changed that, but it did get rid of the saturation on the clarinet shrieks and some of the other instrumental outbursts that also mars the Harmonia Mundi recording. Domaines II is also a very short piece: 30 minutes. What may have been acceptable for an LP of new music makes a very short measure for a CD, so it’s now probably best to go for the DG set.